Do we all remember the blue screen of death from PC's 'glory days'? To me, this screen is worse. And I see it at least 10 times a day when I am working with Final Cut. That, or my Mac just shuts down completely. Without explanation. But mostly, I just cry. We are a nation of spoiled brats. We have daily miracles at our fingers tips, and all we can do is complain. Push a button, and heat comes on. Flip a switch, and you have light. Turn a handle, and hot or cold water gushes forth. Imagine what folks would have thought about this 100 years ago. For a small fee, people will haul away your garbage, provide you with endless clean water, and assure the continuation of your electricity, telephone and Internet. Feel like talking to friends or relatives 3,000 miles away? Rather than waiting six months for a letter, you merely press a few buttons and viola – instant communication. Feel sick? You can visit a doctor who can look inside your body without hurting you. He can use marvelous diagnostic tools to determine what's wrong. He's even unlikely to apply leeches to balance your humors. How amazing is that? Feel like going somewhere? You don't have to hitch up the horses and travel for hours through inclement weather. You can hop in your car or take public transportation. Feel unsafe? Not to worry, there are thousands of soldiers thanklessly laboring in foreign countries under dangerous circumstances to protect you. This is in addition to all the domestic police officers, firefighters, EMTs and other emergency personnel whose sole duty it is to protect or take care of you. We can fly through the air, for crying out loud. For how long has mankind longed to fly? Now we can do it anytime we wish. When nature calls, we don't have to trudge outside in subzero weather and freeze our fannies in an outhouse. Nor is our public health endangered from water contaminated by human waste. Only by reading about the horrors of such diseases as cholera or dysentery can we appreciate the freedom from such conditions. We can know what's happening on the other side of the planet within seconds. We can purchase consumer goods from any country in the world. Where is our appreciation for these miracles? I no longer fear my children will die of smallpox, the plague, scarlet fever or malnutrition before they reach maturity. Instead, I can look forward to someday seeing my grandchildren because my girls, unlike earlier generations, are likely to make it to adulthood. Though we are the daily recipients of these and other amazing miracles, what do we do? We complain. We could be suffused in awe and appreciation for all these wonders, but noooOOOOoooo. None of this abundance is good enough. We want more, we want better, we want newer. We want the government to give us stuff for free, stuff like health care and housing, food and employment. These are things that earlier generations knew were our own personal responsibility to provide for ourselves. Instead we prefer to whine and gripe and moan our way to socialism because we've become a nation of professional victims. How about we put things into perspective? If we counted our blessings as often as we carped about our problems, we would be overwhelmed with gratitude. Read that last line again because it's important. Sometimes it seems that all we do is complain. Our jobs, our spouse, our kids, our finances, our politicians (OK, I'll grant this is often justified), the economy, the weather, the traffic, the credit card bills, the car payments, the run in your pantyhose, the ding in your car, the malfunctioning CD player, the long lines at the mall, the waiter who forgot your bread rolls … Stop! Take a deep breath, and count your blessings for once. In a world plagued by illiteracy, your children can read and write. In a world plagued by people living in cardboard boxes, you live with indoor plumbing. In a world plagued by diseased children running naked through the streets, your kids are warm and well fed and clothed. And yet we gripe when our Internet service is interrupted, when the traffic light turns red or when we didn't get the diamond earrings or big-screen TV we "really wanted" for Christmas. You see where I'm going with this? When we complain, we forget about our blessings. I'm sure anyone who has ever traveled to Bangladesh or the Sudan came home overwhelmed by their good fortune. Or maybe not. Maybe they complained that the high-speed Internet service on the airplane wasn't fast enough or their luggage was delayed at the baggage carousel. To quote this YouTube clip, everything is amazing right now and nobody's happy. We live in an incredible world, and it's wasted on us. How quickly we have come to think the world owes us something. Why are we no longer falling down in gratitude for our prosperity and relative affluence? In fact, it's our prosperity and affluence – and the loss of a strong religious foundation – that's caused us to forget our blessings. When you raise spoiled brats, they're unlikely to learn to appreciate simple truths such as moral character, a work ethic and gratitude. Geez, folks, grow up. Stop acting like spoiled brats. Look around you. Learn to be grateful to God. And if God isn't "your thing," then at least be grateful for your freedom and those who fought and died to give you the opportunity to act like jerks. In this upcoming year of economic uncertainty, make a resolution to stop taking it all for granted. I finally got the outside Christmas lights up today. I had made my mind up not to do them as it is so late, but over the last couple of days, I've noticed scores of houses all of a sudden have their displays up. Coincidentally, this has also been the first multi-day stretch of time that the ground has been bare since basically the second week of November...so perhaps that made some people decide to put their lights up while they had a chance. In fact, as I put ours up tonight, it started snowing. Looking up and down our snowy street tonight at house after house of Christmas displays as the snow fell while my wife was inside baking cookies....it was pretty much what I dream about this time of year. The only thing missing was a kid or two helping daddy untangle the lights. Ah, soon enough I say. Soon enough. Growing up, cookies that were part of Christmas for us were either chocolate chip or peanut butter with Hershey Kisses. After having spent the last couple of Christmases watching (and helping) Danielle bake, frost, and sprinkle cookies, I have to say that I really love doing that with her! It's fun bonding time. I'm pretty sure we're guaranteed a white Christmas. We have some storms on the horizon that promise to dump quite a bit of snow here. 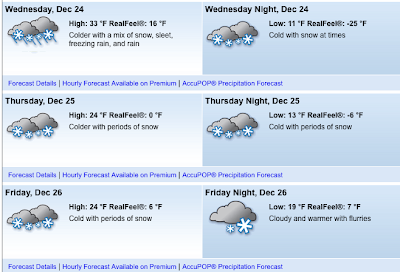 Of course, the forecast can change, but it seems VERY promising for those who are hoping for a white Christmas. And, as you can imagine, I am thrilled. Danielle and I have not started our Christmas shopping yet. To be honest, though, there's not really that much we have to do. With our family situations like they are (four parents, six siblings, my five nieces & nephews, & Danielle's two nieces), buying presents for everybody just isn't reasonable. So we've cut way back this year. In fact, we still aren't even sure whether we are going to get each other anything. I have to be honest; Al's sermon on Sunday really made me think about the insanity of the American Christmas. It's sickening...and I'm not so sure I want any part of it. When and if we ever have kids, remind me of what I just said when I am trying to provide them with the most incredible Christmas ever. Another reason I think we have toned down Christmas give-giving is because there are simply too many birthdays in the month of December. We would like to request that people who are close to us either in family or friendship...please stop getting frisky during the month of March. Just wait a little bit. Thanks. I have always loved this time of year. Even now, as I wrestle with God through the struggles and pains of life, I still manage to crack a smile now and then about the childlike excitement I have within me during this season. It is a time of year that I really miss my mom, even though it has been 16 Christmases. This year, I will miss my dad too. It will be our very first Christmas apart. Ever. Danielle did that last year when we were in Myrtle Beach with my dad and his wife. It's tough. But it is the way things are. I should stop writing. You're probably bored to death. Dave's 1st White Christmas Outlook! That is the question on everybody's mind these days. Everywhere I go, I get asked the question: So, Dave, will Santa be able to land his sleigh safely this year or will he need to fly commercial? If you can read it, you can see that Christmas Eve starts off icy....but then the temps plummet on Christmas Eve night, just in time for Santa to come! He'll have to bundle up though, as the wind chills will be in the MINUS 20's!! And then Christmas Day itself looks GLORIOUS with snow and a high of 24 and a low of 13. If you have any other questions, please don't hesitate to ask! In the meantime, enjoy your day and don't forget to be good boys and girls....you wouldn't want Santa to have to make a special stop at your house in wind chills like that just to leave some coal, would you?????? You may or may not have read/heard about the F-18 crash in San Diego yesterday. The aircraft lost both engines while trying to land. The pilot ejected safely, but the plane - unfortunately - crashed into a neighborhood, destroying two houses. One of the homes was empty at the time of the crash. The other home was where Dong Yun Yoon's family lived. The crash took the life of his entire family -- his infant daughter Rachel, who was born less than two months ago; his 15-month-old daughter Grace; his wife, Young Mi Yoon, 36; and her 60-year-old mother, Suk Im Kim, who he said had come to the United States from Korea recently to help take care of the children. know he did everything he could." Can you imagine the pain this man must be feeling? For him to say this just blows my mind. PLEASE read the rest of the story here. This man possesses amazing strength and incredible character. I want so much to drive to San Diego, give him a hug, and see if there is anything he needs. Thankfully, he and his family were very involved in their church and will have a close church family helping him through this time. I can't imagine what the pilot of this plane must be feeling. I cannot imagine what this man who lost his entire family must be feeling. They are both in my prayers tonight. I know that I haven't blogged for a while, but -- really -- there's not been too much to blog about. It's been a rather difficult few weeks, however, as I have been battling a bunch of stuff. We are shooting a video today and tomorrow for services at Grace this weekend. I am looking forward to the editing process...it should be pretty interesting! I finally ordered a new cell phone. Mine has been broken for over a month...but thankfully...is was time to upgrade anyway. I was going to upgrade to a BlackBerry or even switch over to AT&T's iPhone, but I just didn't feel right about spending the extra money (not to mention the increase in plan costs). So, I went with a generic old phone. Best of all, it was completely free. And I'm happy about that. Danielle and I are almost done Christmassing up our place. The inside is pretty much done; however, I need to tackle the outside. I think it has been difficult because we've had so much snow already (which makes it hard to do the outside stuff). Speaking of snow, we are now up to 45" of snow for the season so far. Keep in mind, our NORMAL snowfall for an entire winter is 83"....so we're more than halfway there already...and winter doesn't even begin for two more weeks! Incredible! We are now the owners of a snowblower. I can't begin to tell you what a difference blowing makes over shoveling. Night and freaking day. A dear friend of my dad's passed away over the weekend. Bob was one of the happiest people I've ever met. Bob's passing makes me think about my dad's life and how he won't be around forever. But, I've always said he is going to live to 105, so he has at least 35 more years. Thank goodness. I'm grateful for Pastor Mike and the time that he has invested into me. I am grateful for his words of wisdom and wise counsel to me during this season in my life. I am also thankful for the time that he is spending with our Wednesday night group (the band of misfits, as I call us). If there is anything that I have learned with this group of guys on Wednesday nights, it is this: that things don't always have to be as they've always been. This man, one of my pastors and a friend, sees something in us that we don't yet see. That he sees what he claims God sees in me gives me strength to continue pressing forward in the hopes that, one day soon, the new creation will take hold in me. That one day soon, the old will pass away...and the new will come.